A new Starbucks promo starts today! Buy holiday drinks, and get one free. You can get a little card that you collect 5 stickers on it – one sticker for each time you purchase a holiday espresso beverage. When the card is full, you get any grande handcrafted espresso beverage. Some things to note: The card specifies that you have to collect the stickers between today and December 25th. 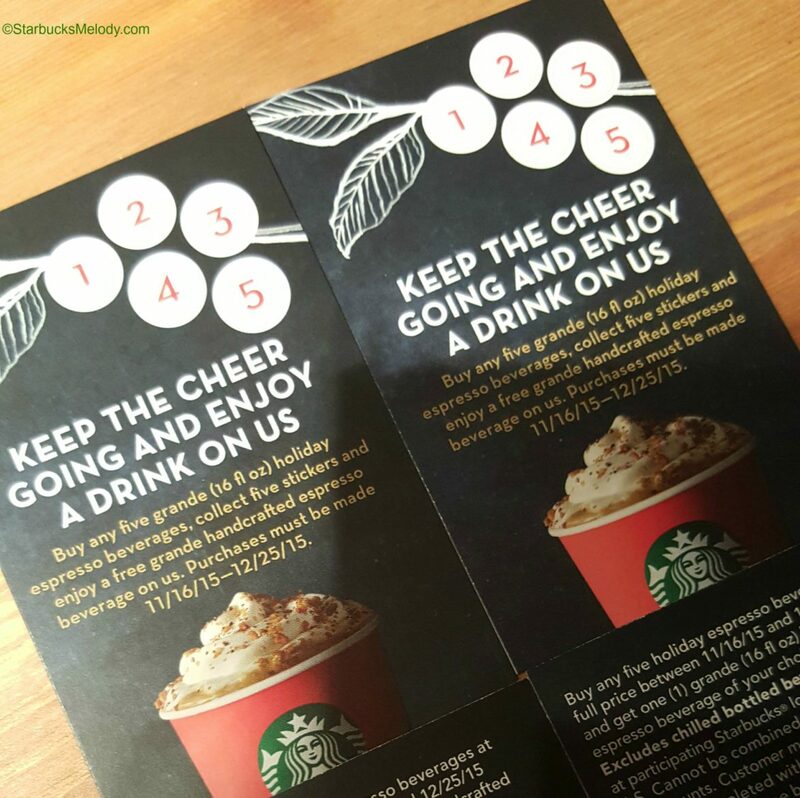 Once you’ve filled up the card with 5 stickers, you must redeem it for a free drink before January 31, 2016.. The card has no requirement what form you’re buying the drinks in, so order your favorite holiday beverage iced, hot, or as a Frappuccino. Starbucks did this same promotion last year, and you could purchase any size of the drinks and get the stickers. This year the card specifies that you must be getting a Grande size. I would hope that if you were buying a Venti holiday espresso beverage that your barista would still offer you a sticker for your card, given that you’re getting a more expensive drink. That could be a moment at the register where the barista would hopefully ‘make it right,’ so to speak. Also, you have to be paying full price for the drink to get the sticker. This wasn’t clarified on last year’s card either. 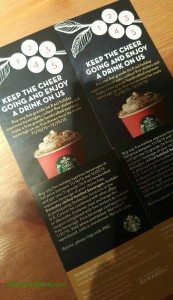 So you do not get a sticker if you’re using a free drink reward to get a holiday drink. And you do not get a sticker if you’re getting a partner discount on your beverage. Of course if you are paying for your beverage with a registered card, you will still earn My Starbucks Rewards too. (If you liked this article, you might also enjoy 7 Tips for Saving Money at Starbucks – using promotions like this one is one way to save at Starbucks). The Bellevue Teavana Tea Store Gets a Fresh New Look! Summer Iced Grande on Starbucks: Buy 5 & collect the stickers and then get one free! Here’s my recent experience with this, Melody. The store definitely “made it right”. We were recently in Charleston, SC, for my son to meet his favorite author at a book event. We had some time to kill, and of course, a refreshment was in order. Holiday drinks galore were what we purchased. My husband wanted his usual Iced Coffee, and I had them put Chestnut Praline syrup in it… the fella at the register gave me a sticker for the Iced Coffee, too, because, “After all, you’re getting a holiday syrup.” 🙂 By the way, my daughter had an Eggnog Frappuccino, and even though I’m not a big Frappuccino person, that one is GOOD! I noticed this morning as I was getting my sticker for my Chestnut Praline that here in southern AZ you can get Christmas Blend pulled as an espresso shot for your drinks. I cannot wait to try that! Did that start everywhere? Or am I in a lucky region? Has it always been specifically Grande? I always get tall and over the years have always earned stickers for it! @Megs – I meant to reply to you sooner. Last year you could buy ANY size and get a sticker. It’s a bit of a bummer. I just don’t order a Grande hot latte type drink. I’ve already had several tall CPLs this year, but no stickers. Such is life. Just out of curiosity, does the fine print about “cannot be combined with other offers” include free rewards? Do Pumpkin Spice Lattes count? I would assume so since it’s only a holiday beverage but the barista at Starbucks said it wasn’t included?! @Jerry – The answer is “no” – But it’s just one sticker and I would hope that most partners would make every moment over turning into the barista-stickers-sheriff. All I can tell you is that can’t expect to get a sticker for a PSL. My neighborhood store was a bit slow in making these widely known — I just got mine today; the barista told me that they’ll give stickers for both grande AND venti holiday beverages, though I have to figure people’s mileage will vary on that one. Still, with my new addiction quickly becoming Gingerbread Latte with the holiday spice sprinkles, I think I’m good! Went to the Starbucks on Gerber road in Sacramento bought a venti holiday drink and they wouldn’t give me a sticker stating that since I didn’t buy a grande I couldn’t get the sticker called Starbucks corporate and had them talk to the manager and she still wouldn’t give me a sticker…. Disappointed in that Starbucks location and will never go there again will go to the other location that was nice and gave me a sticker for buying a larger drink instead of the grande !!!! @Melody, I am still loving your “sheriff” comments. Have to laugh a little really… Also, I was just at my local Starbucks yesterday and ordered 3 tall holiday drinks… got three stickers. It would be nice if things were done the same across the board I suppose but that “inspire” and “delight” stuff is great, too. So far I’ve got 6 full cards saved up for a nice little family treat after the holidays. I finally filled up my card with 5 stickers. Today, I ordered a peppermint mocha frappuccino and handed the barista my sticker card. He said that I could not use the card for anything but a hot holiday drink. I was pretty disappointed, given that the card doesn’t specify that and then I had to pay full price for an expensive frappuccino that I wasn’t expecting to spend today. So frustrating!! Be aware that your drink may not count if it’s cold. We went to Starbucks last night. I bought a Viente holiday Peppermint Mocha and the barista told us that in the future we wouldn’t get a sticker unless we bought a Grande. Makes sense? That would be a NO. Our Starbucks is in Naperville, IL. Not as generous as some seem to be. They need to get the stipulations straight. @Mallory and @Linda – I’m sorry this happened to you. @Mallory – you should definitely call customer service. I had an interesting conversation with a wise person about these things that are happening in the store. It’s interesting: He mentioned that if you create a culture of rules, pretty soon employees will be making up their own rules. (Not verbatim). And it’s fascinating: I think on a very subconscious level, we learn that “no” is the more powerful word. It feeds our ego. Our parents are powerful that they get to say “no” to us. People have to be trained and have it reinforced that it’s just as valuable to say “yes” – And in the examples above, “yes” is the right answer. I will tell you though, the SSC doesn’t know these things are happening, and/or doesn’t care. When I’d talked to a media relations representative earlier this year about the phenomena of baristas being trained to be sheriffs not make great experiences, I literally was met with eye rolling and groans. It was clear that either the SSC just is in denial that this is happening in stores, or they just don’t care. I’ve purchased about a dozen holiday drinks that meet all the requirements for the stickers at various different Starbucks here in southern CA and not one time have I been offered the stickers. I actually found this post because I was googling if they were even doing stickers this year… So dissapointed. I also found out about the promotion late. They do not volunteer or give anything. Very stingy. We used to go to SB almost every night and get a premium drink. I got my card, but it’s like pulling teeth to get those stickers. Maybe they’re covered in gold leaf. You aren’t alone. I can’t even count the number of qualifying drinks we’ve bought that we would have gotten a sticker for. No wait. We bought Ventis. NO STICKER FOR YOU! Don’t most policies of other companies state: Buy one of equal or higher value, get one free? Totally forgot to reply. Haha! So I have used these cards every single day since it came out. I’ve probably filled up 7 or 8 cards by now. I only order tall drinks and I’ve actually only had one person say “Oh sorry it has to be a grande!”. Also, I have only seed ONE barista promote it over all of the stores I’ve gone to. Whenever I see people getting holiday drinks without a sticker or card, I say “Hey don’t forget to get a sticker card!”. i work at starbucks & i keep getting yelled at for doing my job & following the instructions on the stamp cards. now i’m realizing its because other baristas are taking it upon themselves to “make it right” ? lol wow. if a barista is giving you a stamp on your card when you don’t deserve it, please don’t go yelling at baristas who are just doing their job when they refuse to give you stamp for a drink that doesn’t qualify for a stamp. guest should be happy that this promotion is even a thing. Also, Starbucks didn’t make a mistake when they set the rules on the stamp card, its MEANT to reduce the amount of people who will get the free drink after 5 stickers. As if 12/20 in Madison Wisconsin, all locations I’ve tried are out of the cards and partners seem puzzled if I ask for a sticker (and put it on a receipt or other). They do seem to still have the stickers, but not much education from Sbux hdqtrs for the partners on the whole promotion. @Yesi – I apologize in advance that I might say things that sound harsh or you’re not interested in. I’d ask that you open up to these thoughts, and don’t dig your heels in. In the big scheme of things, it doesn’t make any sense not to give a sticker for the Venti size beverages. On top of that, while it might not be thinking process in your store or district, I bet that no executive in Seattle wants partners to argue with a customer over one little red sticker. It’s not worth it. If you look at the kind of philosophy that Starbucks is built on, saying ‘yes’ to create great moments is more important than become a red-sticker-sheriff. If you have any doubts, read the book It’s Not About the Coffee, written by past Starbucks executive Howard Behar. The reputation of Starbucks as a brand is what customer say when they walk out of the front door. If they walk away from the register disappointed, it harms the reputation. In the aggregate, it creates brand bad will. @MadCityDeb – I WISH Starbucks would train partners about everything from ‘creating inspired moments’ to specific training about promotions. Too little time spent in training these days. It clearly stated when this offer expired. I’m confused. You knew it was expired, but called to complain? Sorry, I don’t get it. It was not expired. They expire Jan 31 2016. And it says so right on the back. Yes I did call to complain. Ours expired at the end of December. No clue why you would have cards that expire before anyone else in the country. They advertised this all over. For the record I would not try to use an expired card nor would I complain about not being able to use a card that was expired. I think Starbucks has become so much less customer friendly than they once were. It’s ridiculous how the buyer needs to point out the right thing to do and what rules they are to be following. They used to be so kind about compensating for their bad service. No longer so. Who knows. I only know that they created problems with this promotion themselves. You needed to buy a grande and if you bought a vente, it didn’t qualify. They’re their own worst enemy. I received a Starbucks gift card for Christmas. That’s the only way I’ll get one free. They’re not nice in our town. Chill hon. Didn’t mean to insult. It’s all good. The employees need to be educated, not the public. Between this and the many problems with the Starbucks For Life contest and the 4 days to use your birthday reward, it’s almost like they don’t care about their customers anymore. I know they are a business and are all about making money, but frustrating loyal customers with these antics is not going to do them any favors. I see multiple complaints per day on Twitter about the fast expiring birthday reward and that’s just aimed at the Canadian account. I’m sure there are many more complaints being lodged with the US account, Facebook and customer service. And we just had a price increase in Canada. Lots of people are not happy with Starbucks right now. BIRTHDAY REWARD? THERE’S A BIRTHDAY REWARD? WHAT THE…? WHERE? NEVER HEARD OF IT. OH MAN! NOW I’M REALLY MAD! Linda – You should get a birthday reward at the ‘Welcome level’ and above (ie. you just have to have a registered card). It can be used for the same things as the regular reward, though you have to specify it as a ‘birthday reward’ when you go to use it. It used to be good for a month, then it was a week, now it’s four days. It’s supposed to be loaded on your card two days before your birthday and expire the day after your birthday. There have been a lot of complaints as people were not aware of the change in how many days it was available for. I got my birthday reward email the day before my birthday and had to use it by my birthday. That was December 21st. I had no time to deal with crowds there that day. So my birthday drink was pretty much good only for a day and a half. They used to sit on the card until I used it. So that got wasted this year. Cindy – I was just reading through some of the MyStarbucksIdea posts and there were quite a few people describing the same experience as you (ie. only having a day or two it use the reward). I’d say that’s part of the problem with having such a small window. If there’s some technical issue with it being loaded on time, it highly increases the chance of someone not being able to redeem it. Had same problem- bought a Venti and a Grande- only one sticker. Barista said no sticker for Venti- which cost more, no common sense in this. I understand when it comes time for the complimentary beverage it will be a Grande though I don’t understand why if you spend more you are not given the same sticker if you paid less. Guess that instinct I had to boycott Starbucks was right! So what can u get when you have all 5 stickers. So I have 3 full holiday cards that my gf and I filled up on vacation in Puerto Rico. She tried redeeming one here in Texas, and they wouldn’t let her because the cards are red in Puerto Rico, and green in Texas. She said the red ones were only good in PR. KINDA BUMMED. Tried to use mine yesterday and told it had to be used by Dec. 25th. I showed them where it didn’t expire until Jan. 31, 2017. The manager wouldn’t speak with me.